The Princely family was confirmed in the Dignity of Hereditary Princes of the Russian Empire with the prefix “Siatelstvo” (Illustrious Highness) by the sanctioned Ukase of the governing senate of Russia on the 31st March 1901 with the inscription in the fifth part of the genealogical book of Russian Nobilty. TCHKOTOUA–CARPENTER MARMON () Arms–(Enrolled at Coll of Arms, London).–Surmounted by a princely coronet, quarterly 1st. Azure, in pale, a Maltese cross and a crescent, or, 2nd gules, a figure of St George on a horse argent, helmet and reined or, piercing with a spear, a dragon, proper, 3rd gules, on a mount vert, a stag statant contourné, or, 4th Azure a golden fleece. On an inescutcheon, ensigned by a coronet or, quarterly, 1st and 4th vert a Maltese cross or; 2nd and 3rd az a lymphad in full sail, oars in action or. HIS ILLUSTRIOUS HIGHNESS PRINCE NICOLAS TCHKOTOUA, Hereditary Noble de Tchkonia, Doctor of Law (Honoris Causa), of the Andhra Research University of India; b 24 Sept 1905* (at Batoum. Russia); m 21 June, 1934, •Carol Carpenter, dau of Col Howard Carpenter Marmon (representative of the English families of Carpenter, Myers and Moore, an ancestor of the last family, being the Tory, Peter Moore, who after the American Revolution refused to relinquish his allegiance to the British Throne). 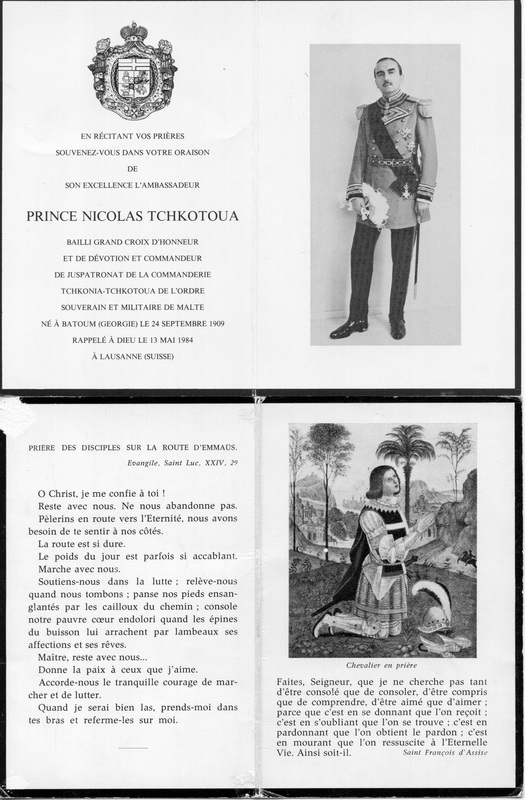 PRINCE NICOLAS TCHKOTOUA, who is the son of the Hereditary Noble of the Russian Empire, the late Charles de Tchkonia, by Princess Pelagie Tchkotoua, his wife, was adopted by his maternal grandfather, the late Prince Platon Tchkotoua, and bears the name and title of Prince Tchkotoua with the prefix "Siatelstvo" (Illustrious Highness), and the conjoined arms of the two Houses of Tchkotoua and Tchkonia, in virtue of the judicial ratification of the adoption of 20 June, 1920, and the authorisation given by His Imperial Highness, the late Grand Duke Kirill, Head of the Imperial House of Russia, at St Briac, France, 26 July, 1938. Lineage (of House of Tchkotoua). This Princely family was confirmed in the dignity of Hereditary Princes of the Russian Empire, by the sanctioned Ukase of the Governing Senate of Russia, 31 March, 1901, No. 1368, with the inscription in the fifth part of the Genealogical Book of Russian Nobility. Traditionally it has its origin in the Byzantine Empire, the first known ancestor being BERO TCHKOTOUA, who founded the Natsimeri Monastery and built the family castle at Saberio (district of Samourzakany, Georgia), in the 9th century. They have since that time been feudal Princes of Saberio, and in the year 1214 Prince Demetrious Tchkotoua was Court Chamberlain to King George I, of Georgia. Pope Innocent III, in 1218, appealed to the feudal lords of the Kingdom of Georgia, to support the Crusade then proceeding. Princes Platon and Zourab Tchkotoua were among those who responded. The Princes Tchkotoua have been from time to time appointed Regents of the province of Samourzakany, by the Georgian Kings, notably in the fourteenth, fifteenth and eighteenth centuries. 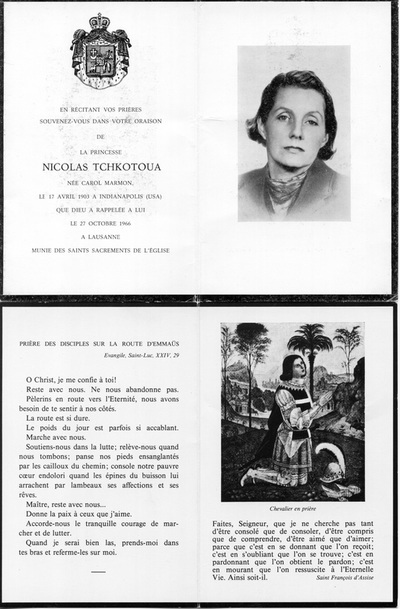 ﻿﻿Timeless - a review in the Financial Times (22nd Sept 2008) of Nicolas Tchkotoua's 1949 novel, Timeless, as republished in 2008. L'Ecosse à Marbella - a Point de Vue article (No 2621, 14th Oct 1998) on the wedding of Princess Cristina Tchkotoua to Alexander (Sandy) Livingstone.